This is the first in a series of blogs about getting organized so I can complete two projects I have completed first drafts for (one a novella, one a full-length novel). Wondering about the origins of this series? Read this blog: Getting Organized. 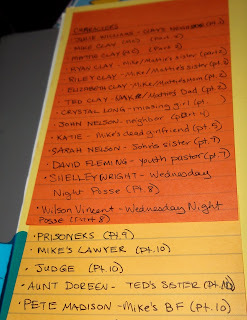 Characters play such a huge role in a story that it seemed fitting to start the process of getting organized by getting the characters in my novel (and novella) organized. I can already tell sticky notes are going to be my best friend when it comes to this project, because I've used at least 90 on characters thus far. (Yes, that means there will be another blog post about characters in the future. 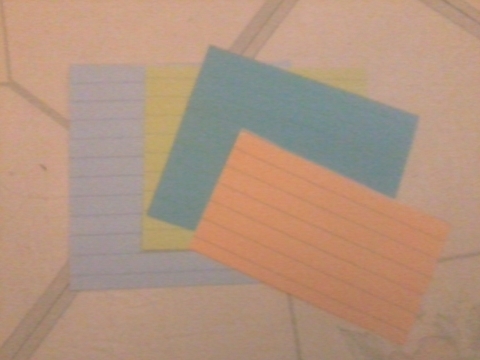 What have I done with my sticky notes, exactly? Just follow the jump to find out. First, I went through with the longer, skinny stick notes (Post-It(R) calls them them Page Markers). 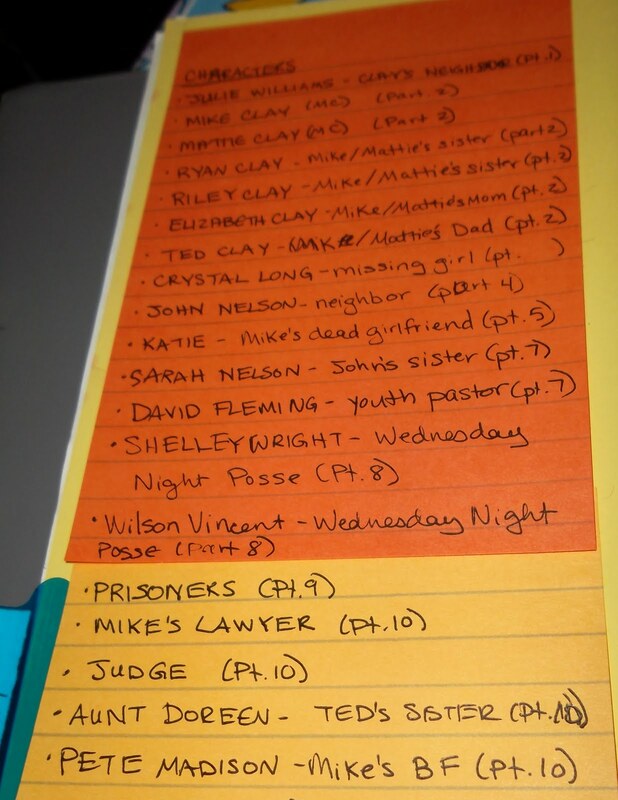 I scanned each part (chapter), noted the characters both physically in a part and mentioned in it, and then wrote them down on the markers. I then placed the markers at the beginning of each part so you could see at a glance which characters are in it. You could probably use the markers to note where each character shows up in each part down to the paragraph and line, but I didn't. I wasn't doing anymore than scanning for names. Maybe I'll want to later, when I'm doing a more in-depth look at the characters and their functions. At the moment, this is good enough for me. Another thing about the markers - you might have noticed they're color coded. I did this so I can tell at a glance which types of characters are in a given part before I start to read it. You might have noticed that I used different colors in the novella to note the same categories in the novel. Part of it was because I ran out of pink markers at the end of the novel, but part is also that I don't feel like I have to use the same colors for markers in every story. As long as I make a key of which colors signify which category and use the same type of sticky note consistently, I'll be fine. If you're someone who needs to have consistent colors from project to project, that's fine. It doesn't change the basic system. 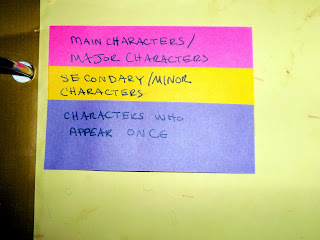 And second, I took the long, lined sticky notes and wrote down a list of the characters in the story. 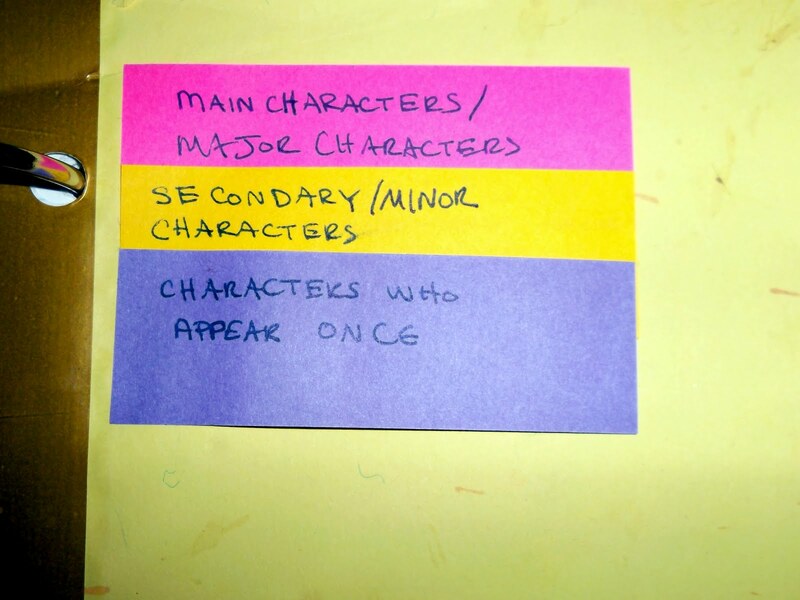 In the case of the novel, I picked colors for the two MCs, and two of the minor characters who show up the most often, then made lists of characters based on their relationships to the MCs or minor characters picked. I noted beside each character what the relationship was, and which part they first appeared in. For the novella, however, there were a few less characters, so I simply listed the characters, who they are within the context of the story, and when they show up. Another something you might have noticed is that I trimmed the lined sticky notes. One thing you will find out about me in short order is that I try to find a use for everything - especially paper items. You'll see these bits of paper again later on in the organizing process, I'm sure. In the meantime, here they are after being trimmed off. Are my characters being created for only one purpose, then discarded and neglected? Are they appearing too often and getting on people's nerves? Or have I achieved that perfect balance of character usage? Good, because I am, too.